Orange County Mayor Teresa Jacobs and each of the six members of the Board of County Commissioners recognized an individual in their district for their efforts in helping their neighborhoods flourish. 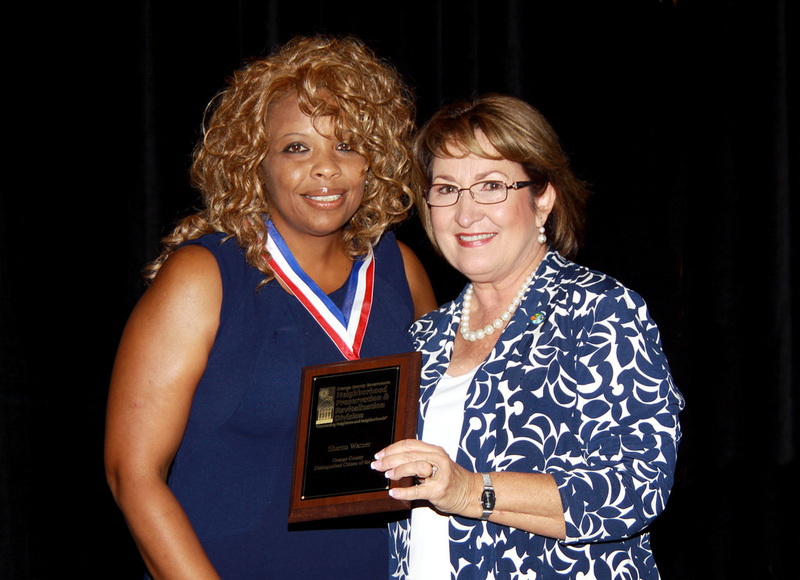 Sharon Warner received the Mayor’s Distinguished Citizen of the Year award. Warner is the founder of Family & Friends United, Inc., a program that started locally more than 20 years ago. The program gives children the tools they need to better deal with challenging situations they may encounter at school and outside the home. Over the years, hundreds of children have participated in Warner’s program and many have graduated from college or entered the military after their time with Family & Friends United. District 1 – Betsy VanderLey is the vice-chair of Orange County Planning and Zoning Commission and serves on numerous volunteer boards throughout the community including Orange County’s Affordable Housing Board. She is a business developer, entrepreneur and a successful small business owner. District 2 – Regina Melvin is the founder of Lockhart Acres Farm, a nonprofit community farm that grows fresh food. She has also played a vital role in the Green School Initiative at Lockhart Middle School. In addition to donating a greenhouse and a rabbit, she is also designing and installing a pollinator garden. In 2013, she worked with the residents of Lockhart and Orange County’s Neighborhood Preservation & Revitalization Division to form the People of Lockhart Community Association (POLCA) and became its first president. As president of POLCA, she organized Lockhart’s First National Night Out Event in 2013. District 3 – The Azalea Park Little League is a youth sports organization founded in 1964 by five parents who revitalized the community and the local ball field. Recently, the mural of baseball legend Roberto Clemente was painted over by vandals. The Azalea Park Little League, along with community residents and leaders such as Orlando City Commissioner Tony Ortiz, were able to join efforts and ensure that the mural was re-painted and community spirits were restored. District 4 – Pastor Abner Adorno has worked closely with the Coalition for the Homeless of Central Florida and the Women and Children’s Shelter by cooking meals, providing personal hygiene supplies and being a life coach. He has also served as the community’s Hispanic liaison for Orange County Public Schools and assisted in establishing an elementary school in the Dominican Republic. For the past two years, along with members of his congregation, he has served District 4 through extensive volunteer work at the District’s Back to School event, the Three Kings Day celebration and community clean ups. He has assisted in distributing over 3,000 gifts for children and other volunteer organizations. District 5 – Timothy J. McKinney leads a grassroots initiative called the Bithlo Transformation Effort, which is recognized as a model in community health improvement. He has also received various community recognitions including being named one of the 50 Most Powerful People in Orlando Magazine, The Hometown Hero Award by Bank of America and has received a Hearts of Gold award by Orlando Magazine in 2011. District 6 – As the founder and Pastor of Rising Sun Baptist Church, Pastor Michael Kimbrough continues to provide opportunities for local youth to reach their dreams and goals. He founded the Shine Performing & Creative Art Training Center in 2005 and later founded the Pine Hills Community Performing Arts Center in 2010. He also organized the first Pine Hills Cultural Arts Festival in 2014 and plans to continue coordinating this as an annual event. He has also assisted with coordination of the Stop the Killing Start Living Peace campaign. He volunteers with the Orange County School Board and received the Orange County Parent Teacher Association Volunteer of the Year Award. He is active in both the Pine Hills Council and Pine Hills Safe Neighborhood Partnership. The 2014 Florida Neighborhoods Conference, hosted by the Orange County Neighborhood Preservation & Revitalization Division at Loews Royal Pacific Hotel, featured over more than 25 workshops and more than 350 neighborhood and community leaders attended the event. The Conference was held July 10-12, 2014. “This conference is a great resource and tool for community leaders to help improve their communities,” said Lavon Williams, Orange County Neighborhood Preservation & Revitalization Division Manager. The annual conference strives to educate and assist citizens on how to revitalize their neighborhoods and make these communities the best places to live. Citizens, community leaders, grassroots campaign organizers and nonprofit organizations joined together during the three-day event to share ideas and improvements in their communities. To learn more about the event, watch News 13 Orlando’s news feature. A collection of photos from the event are available for use by the media and are located on Flickr.